Mrs. Annie Lou Tyndall King, 63 of 685 Landing Dr., passed away Friday, July 6th, 2018 at Kitty Askins Hospice Center in Goldsboro. Funeral services will be held Tuesday, July 10th 2:00 PM at Royal-Hall Funeral Home Chapel, 301 McKoy St. Clinton, NC. 28328 with Rev. C.H. Lee and Rev. Charles Ray Jernigan officiating. Burial will follow at Grandview Memorial Park. Born on January 17th, 1955, Annie was the daughter of the late Stephen Everette Tyndall. She was the widow of the late Larry James King and a retired waitress. She loved her family and will be truly missed. 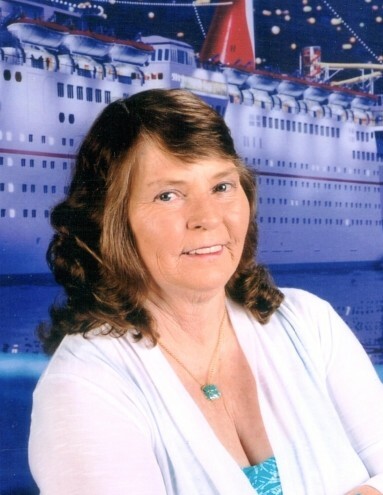 Annie is survived by her two sons: Roy D. King and wife, Bonnie of Newton Grove and Aaron L. King of Clinton; her mother, Daisy Tyndall of Clinton; four sisters: Virginia Herring and husband, Glenn of Oak Island, Barbara Lee and husband Jerry of Clinton, Patricia Lane and (Allen Todd) of Clinton and Brenda Gautier and husband, Mike of Clinton; her two brothers: James Tyndall of Clinton and Billy Tyndall and (Jeff Norris) of Burgaw; three grandchildren: Cassidy Leigh King, Ashlyn Delaney King and Ashor James King. In addition to her father and husband, she was preceded in death by her brother, David Wayne Tyndall. In lieu of flowers, memorials may be made to Kitty Askins Hospice Center, 107 Handley Park Ct., Goldsboro, NC. 27534. Royal-Hall is honored to serve the King family.